Thirty-three Holdrege FFA members represented the Chapter at the 90th Annual State FFA convention in Lincoln, NE April 4-6th. The theme for this year’s convention was “Make it Count.” Over 7,500 members and guests from 170 FFA Chapters attended State Convention. Also in attendance was National FFA Eastern Region Vice President Gracie Furnish of Minnesota. Nebraska FFA members and chapters were honored for their accomplishments at the 90th annual State Convention. Events were held at the Pinnacle Bank Arena, hotels in Lincoln’s Haymarket, and the University of Nebraska-Lincoln East Campus. FFA members, advisors and guests had the opportunity to listen to motivational speakers and retiring state officer addresses during convention sessions. They were engaged in leadership workshops, watched students compete in Leadership Skills Events and attended the annual Career Fair. Students also participated in the State Career Development Events on UNL’s East Campus. Students had the opportunity to learn about future career opportunities and got an inside look at industry leaders and projects such as Tractor Supply Company, Snyder Industries, and Li-Cor during tours sponsored by Nebraska Farm Bureau. Eleven members assisted in packaging meals for Meals of Hope and Union Bank & Trust on Friday morning. The Holdrege Chapter was recognized with a Superior Gold rating and as a Top 10% Superior rated chapter of 170 Chapters in Nebraska. This application is a detailed summary of the chapter activities for the past year and will be competing for national honors this upcoming fall. The FFA Chapter also earned recognition with ratings in the areas of Growing Leaders (Gold), Building Communities (Gold), and Strengthening Agriculture (Gold). The Holdrege Chapter was also recognized by the Nebraska FFA Foundation for raising over $7,900 for the I Believe In the Future of Ag Campaign. This amount was added to the state campaign funds generated and in return the chapter received over $8,600 back for supporting the campaign. FFA Degree. Special recognition was bestowed to Grady Johnson and he was one of 24 Finalists for Star of Nebraska Recognition. 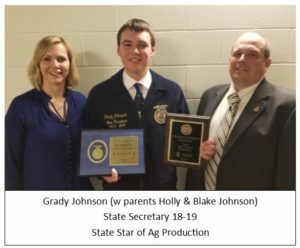 Grady was named the State Star of Ag Production in Nebraska from a smaller pool of ten production finalists. Grady Johnson was elected to serve as a State FFA Officer for the 2018-19 year. 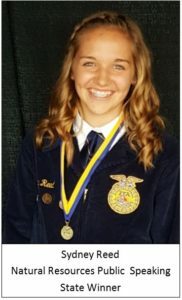 Grady and six other members will represent the Nebraska State Association this year as a delegate to the National Convention and will work with numerous FFA Members across the state and national level. He will also serve as a face of the State Association on boards and campaigns with agricultural business and industry leaders. Grady is the first Holdrege member elected to State Office since Brad Jensen in 1991-1992. Holdrege FFA members excelled in Proficiency Award recognition. Senior Grady Johnson was a finalist in three areas. He was named the State Winner in Diversified Crop Production Placement. This application will advance to National Judging this summer. Grady’s other applications in Sheep Production and Diversified Ag Production Entrepreneurship were state runner-up. Senior, Alex Wells, was named a State Runner-up in Ag Services. Junior, Caden Erickson, earned 3rd place in Grain Production. Finally, senior, Malina Lindstrom, place 4th in Beef Production Entrepreneurship. The Holdrege Chapter made many accomplishments in the area of Leadership Skills Events. Sydney Reed was the State winner and Sophomore Maddie Moore earned a gold ranking in the Natural Resource Speaking Event. Malina Lindstrom received a silver in Senior Public Speaking. The Holdrege Conduct of Chapter Meeting Team earned a silver rating with their Demonstration. The team consisted of Damien Smith, Rudy Sanko, Lauryn Ivey, Samantha Schemper, Karli Vap, Janessa Landin, Josh Reed and Sabyn Pettit. Most of the chapter members competed in the State Career Development Event contests while in Lincoln. Competing in Veterinary Science were Morgan Marquardt, Sabyn Pettit, Shelby Schmidt, and Ally Johnson. The Meats Evaluation team made up of Damien Smith, Rudy Sanko, Tyler Bialas, and Trenton Weak. Tyler Bialas earned a red ribbon. Cassidy Connell, Justine Johnson, Sierra Schemper, and Amanda Taylor were all a part of the Food Science Team. The team earned a white ribbon. Individual ribbons went to Cassidy Connell receiving white, Justine Johnson receiving red, and Amanda Taylor receiving blue. Competing in Agri-science was Josh Reed, Hannah Schroder, Cassie Fulmer, and Heidi Buettner. Individually Josh Reed and Cassie Fulmer received blue Ribbons and Hannah Schroder received red a ribbon. The team earned a red ribbon in the competition. The Agronomy team received a red ribbon, the team consisted of Drake Johnson, Spencer Knuth, Tyler Badertscher, and Josh Reed. Individual ribbons went to Spencer Knuth and Tyler Badertscher, receiving blue ribbons, and Drake Johnson receiving a white ribbon. Hunter Brenn, Alex Wells, Malina Lindstrom, Grace Borden, and Samantha Schemper competed as a team in the Livestock Management CDE. The team received a purple ribbon in the beef portion placing third overall. They received a red ribbon for the entire contest. 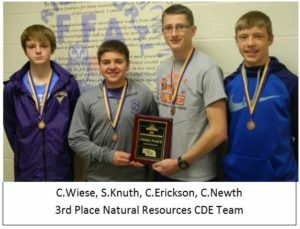 The Natural Resource team consisted of members Cade Wiese, Carter Newth, Caden Erickson, and Spencer Knuth. Receiving individual ribbons were, Caden Erickson and Spencer Knuth both receiving purple ribbons, Cade Wiese receiving a blue and Carter Newth reviving a white. The team placed 3rd overall and received a purple ribbon. The Poultry Evaluation team received a white ribbon consisting of Morgan Marquardt, Sabyn Petit, Grace Borden and Jenessa Landin. Individual ribbons were Morgan Marquardt receiving a red ribbon and Grace Bordon receiving a white. With such a large number of students attending State Convention, the Holdrege FFA Chapter would like to recognize the sponsors who worked to help transport students to convention and activities in Lincoln during the three days of convention. Thanks to Dan Jensen and Kristy Borden for transporting members around throughout the convention. Additional thanks to Blake and Holly Johnson for assisting with judging the state competitions. Holdrege FFA Chapter members will be concluding major activities for the school year with the 82nd Annual FFA Banquet on Sunday, April 14th at the Ag Center.